Just copy the plugin directory into your WordPress plugins directory (usually wp-content/plugins) and activate it in WordPress admin panel. More information can be found on official WordPress site. You can modify the CSS file in the plugin (/wp-content/plugins/thoughtful-comments/css/frontend.css) to change the styling of plugin action links and the highlights. Or you can just empty/comment out that file and define the styling for all the classes from the plugin's CSS file in your theme stylesheet. 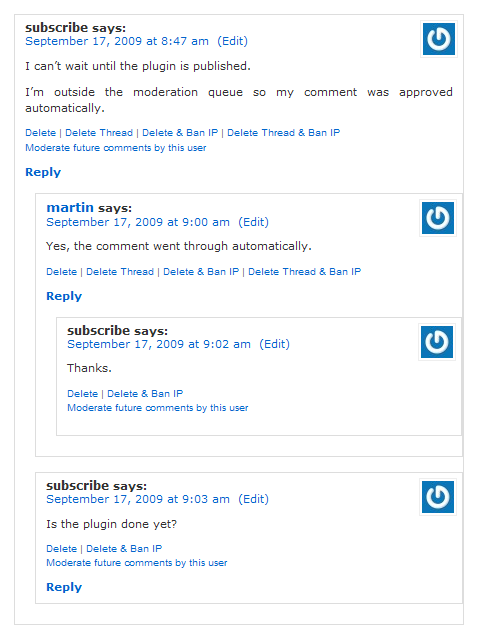 If you want to get the most correct display when deleting a comment and preserving it's replies, you need to use a theme which is using "cascade" display of the comments instead of "nested" display. Differences between these two ways how to display comments are shown on the following picutres. 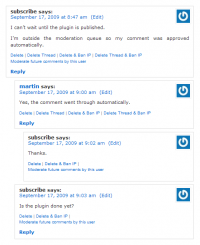 What happens when you delete the topmost comment of 'subscribe' user? The comment is removed from database and its HTML element is removed from the display. Since this HTML element in nested comments display contains all the reply comments, they will be gone from the screen too - but they will remain in the database and if you reload the page you will see that these replies are back where they are supposed to be. 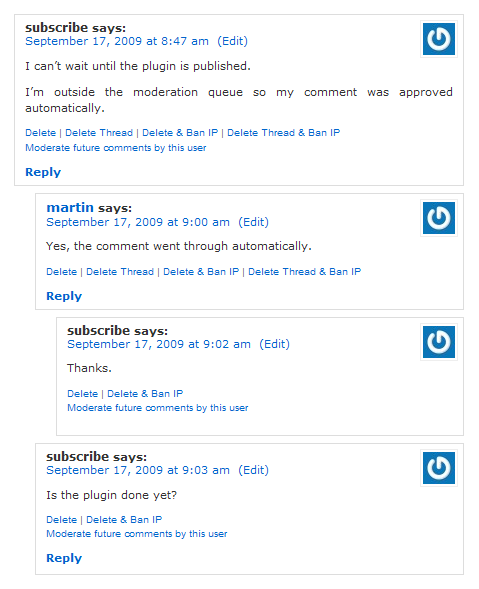 FV Thoughtful Comments assumes that each comment is contained in some HTML element with unique ID which is containing the comment ID, so it works with most of the themes. If you experience problems using it with your favorite theme, we are looking forward to fix our plugin to work with it. Just let us know the name of the theme. 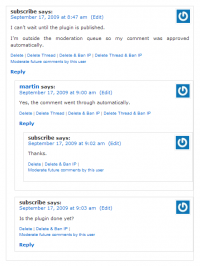 However everything will be fine in the WordPress database.